I was in a basement. I don’t remember whose basement it was, but someone had the bright idea that instead of watching Mannequin for the 14th time we should watch Arachnophobia. After that, I had no memory of watching that movie. UNTIL NOW. 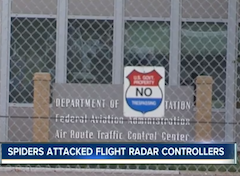 Thanks, spider infestation at Kansas Air Traffic Control Station. Thanks a lot for bringing that terrifying childhood memory blazing back into my brain. The station in Olathe, Kan. had to shut down and evacuate staffers over the weekend, delaying at least five flights at nearby Kansas City International, after complaints of a few spider bites turned into something much more serious, reports KSHB.com. Especially if you are haunted by dreams of eight-legged bringers of terror. Three employees were bitten last week, leading exterminators to check things out and subsequently discover a spider’s nest egg that had hatched. “You’re talking in some spider cases up to 400 and in large breeds, you’re talking thousands from one mom,” said the exterminator. Air traffic controllers had to flee for their lives (or just move to keep from getting bitten, whatever) to another area of the building. The Federal Aviation Administration hasn’t said what kind of spiders were involved but did clarify that no travelers were ever in danger. Exactly what the spiders want us to think, people.